Sixteen Games Off In A Row! We are all aware of the terrible rainfall that has decimated week after week of the non league fixture list, but spare a thought for Wessex League club Stockbridge FC. They have not played a game since November 15th, having had an incredible sixteen consecutive games postponed! However, it hasn’t been just the weather putting paid to Stockbridge’s fixtures. In November, joint managers James Banks and Terry Chapman walked out of the club, taking most of the playing staff with them in a row with chairman Paul Barker over discipline. The duo had assembled a huge squad of forty players, but suspensions, injuries and work commitments left it difficult to field a team. Following their departure, the league granted Stockbridge a two week break as they tried to deal with the situation. And if that wasn’t bad enough, the weather has also had a huge impact. 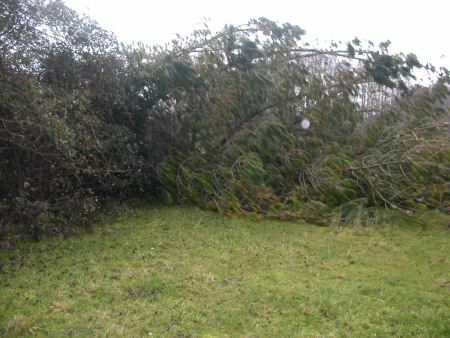 Heavy winds caused large fir trees to be blown over and crash through the fences surrounding the club’s Recreation Ground pitch. Coupled with the rainfall, it’s been a testing time for the club. The pitch is still under water, and even if it doesn’t rain over the next few days, Mr Barker says it would still take more than a week for the pitch to drain. So far, Stockbridge have played just thirteen league games so far, meaning they now have to fit in nineteen matches, plus cup ties, into the remaining three months of the season. Oh. and that last game back on November 15th? A 7-5 defeat at United Services Portsmouth! Posted on February 10, 2014, in UTL Archive and tagged Postponements, Stockbridge FC, Wessex League. Bookmark the permalink. 2 Comments. Had noticed Southend manor’s 10 on the trot but, 16 is quite remarkable. Incidentally, if Southend Manor play on Wednesday, 12th, they will have played Tower Hamlets in back-to-back games two months apart. I am so excited for week 27, but I’m still waiting for Manchester City and Sunderland match.